Kayu (or okayu to use the honorific term) is a simple rice porridge, made from rice, water and a few other ingredients. When Japanese people feel sick, or they feel they’ve overeaten, they often turn to a bowl of kayu. It’s the answer to overfeasting, overdrinking, and general over-indulging. Kayu is related to congee and jook (or juk in Korean) - and loosely related to rice pudding and even risotto. 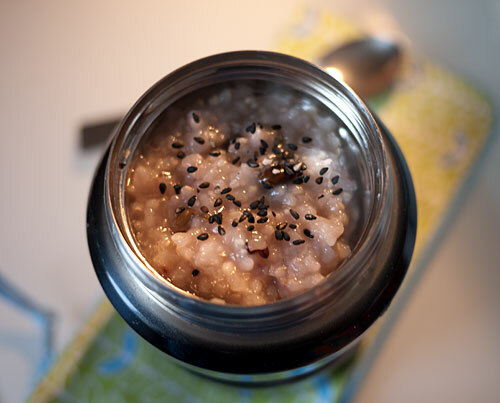 All rice based food cultures have some kind of rice porridge. This kayu is made with brown rice with the addition of azuki beans. It’s a classic combination and a standby of Buddhist monks and other traditional vegans, because it’s packed with nutrition and fiber. The only thing I add to it is some gomashio or sesame salt, carried in a little parchment paper packet. It’s the perfect minimalist, one-pot, one-container lunch, that will help your body recover from the holidays. It’s vegan and gluten-free and everything too! An added bonus: even when you fill a 16-oz lunch jar like the one I’m used here with this kayu, it’s only about 300 calories, give or take a few calories depending on the amount of gomashio or other stuff you add. It does take some time to cook, so make it ahead of time and keep a pot in the fridge, or freeze it in portion-sized units. It’ll keep for a few days in the refrigerator, and a month in the freezer. This will make about 6 cups of fairly thick kayu. To make it thinner, add more water. You don’t have to stick to the exact amounts I’ve listed here - just stick to the ratio of rice to water. I have used a 1:5 ratio, i.e. 1 cup of rice to 5 cups of water. I often make it at a 1:7 ratio too. At 1:10 or so it starts to become less of a porridge and more of a soup. I don’t recommend cooking more than 2 cups’ worth of rice at a time, especially brown rice, since when it turns into kayu it will expand more than you ever imagined possible. Put everything into a heavy-bottomed pot that has plenty of room for the rice to expand in, and let soak for a few hours or overnight. Bring up to a boil over high heat until the water is boiling, then reduce the heat right down. Put on a lid, with a chopstick or spoon or something stuck in between the lid and the pot rim to keep the lid slightly open (this prevents the rice from boiling over). Cook, stirring occasionally, for about an hour. Some rice cookers have a ‘porridge’ function. Use that according to the cooker’s instructions. If you just have a regular straightforward rice cooker, put the ingredients in the pot and let soak as for the regular pot method. Switch the rice cooker on and cook. When the switch goes up, test the porridge - if it’s soft enough, you are done, otherwise switch the cooker on again and repeat. Repeat again if needed until the porridge is as runny and soft as you want it to be. This is the method I use since it takes so little time. Put the ingredients in your pressure cooker - there’s no need to soak the rice. Lock on the lid and bring the cooker up to pressure. Reduce the heat to low, and cook for 30 minutes. You’re done! I don’t own a slow cooker, but I have read that congees and other rice porridges can be cooked successfully in one. Try putting all the ingredients in your cooker and leaving it to cook. It may take a while. I’ve used some gomashio (sesame salt) here, which really works well and adds to the kayu’s nutritional value. You can use any furkake of your choice instead, either store bought or homemade. Adding an umeboshi plum to kayu is classic too. I haven’t tried it yet, but I think that negimiso (miso-onion paste) would work well too. Regardless of what topping you choose, I recommend carrying it along separately and mixing it into your kayu at the last minute, instead of mixing it in in advance. This does sound comforting. And a good idea after the meat-and-sweets heavy holidays. One thing which has upped my bento use recently (besides getting your cookbook!) is that I'm going gluten-free for a month to see if that aids with intestinal and joint issues. Not only are bentos typically rice-based, bringing one eliminates the temptation to zip through a drive-thru. Although I do seem to still be doing a lot of one-pot type of bentos so I need to branch out more. I love kayu! My foreign exchange sister from Japan used to make porridge with miso paste, and it was absolutely delicious. I like to keep it around for quick meals when I don't want to spend lots of time cooking. Wow, that looks delicious! I love azuki beans in anko but I must try this! I kind of didn't like okayu because my dad always made me eat just plain white okayu with nothing on it whenever I was sick so it kind of had bad memories for a while. I have no idea why but it never made me feel better, just deprived! I was a greedy kid... However, as my tastebuds have grown up I find when it's made with nice rice, even the plain okayu is really tasty. Seems like a silly question but, what kind of brown rice is it? I'm not very knowledgable about rice so is it just the kind of brown rice you could buy at any U.K. supermarket or is it like a brown version of sticky rice? Could you make it with white sticky rice too? I used medium-grain brown rice, or the brown version of Japanese style rice. See Looking at rice for the different types of rice I use. In the UK you can use Japanese or "sushi" rice, risotto rice (e.g. arborio, vialone) or even pudding rice. Thu, 2011-01-06 17:44 by Julie S.
xD I'll repeat then - Very interesting recipe, I think it's exactly what I need at the moment. But my question is this - I have a microwave rice cooker with porrige instructions, and I was wondering if it would be pretty much the same sequence as for the regular rice cooker? If your microwave rice cooker can do white rice porridge, it should be able to do this brown rice porridge too, as long as you soak the rice and beans well in advance (at least 3-4 hours). You may have to adjust the amount of water up a bit. Try it out! This looks so delicious! I am definitely going to make it sometime, but to me it seems like it should be sweet. Heheh.. have you ever put sugar into it? I may substitute it for morning oatmeal! Fri, 2011-01-07 18:17 by anon. We often eat brown rice porridge (at breakfast) but I never thought of adding beans to cook directly in the porridge, nor the possibility of using our slow cooker. It's in there now, on low, and we'll see how long it takes. I think it will be better than the rice cooker, because the clean-up will be easier. I will often top this with toasted sesame seeds, or even a bit of toasted sesame seed oil, scallions or bits of nori, and soy sauce. The best is if there are any leftover cooked greens to add as well. This give me another recipe that would be easier with a pressure cooker. Now I think I have to buy one. My wife won't be pleased, as I have no idea when we will put it in the kitchen. I have a 2.5L slow cooker and have had great results making brown rice porridge. When using a slow cooker you don't need nearly as much water as it doesn't evaporate when cooking. I use 100g of rice in 1L of water (this makes enough for about two big cereal bowls) and leave it on LOW for 12hours overnight. In the morning it will look like puffy rice floating in water but don't panic. Strain the rice, reserving the liquid. Put the rice in a saucepan on the stove over medium low heat and pour in at least half of the reserved liquid and cook stiring occasionally (like oatmeal/ risotto) for 15 min or so until you get the desired consistency using as much or as little of the remaining cooking liquid as you like. A note about azuki beans: I wouldn't recommend adding dried azuki beans in the pot overnight as they won't have long enough to cook. Either cook them seperately following package instructions or use tinned ones adding them to the saucepan to heat though before serving. Mmmm! I made this this morning, and its delicious. I didn't have the beans or sesame salt, but it tastes great with just salt. Although for the second portion, I'm going to fry some onions for it, like my mom does for гречана каша (buckwheat porridge). Thanks for a tasty alternative to oatmeal in the morning! This was the perfect recipe for me since I've been snowed in for the past 5 days. I made it in my crockpot last night, and it turned out great! I didn't presoak anything, I just mixed it in the crock and put it on high for a couple of hours (until the beans made it froth), stirring every half hour. Then I turned it to low overnight. When I woke up, it looked a little runny, but it had gotten stuck a bit to the bottom, so I scraped and mixed it in (it wasn't burnt). After mixing, it looked just like porridge. Tastes great, too. I used 5:1 water:rice, and it came out a bit thinner than maki's. I'd recommend starting with 4:1 and adjusting to taste. The beans basically melted (not sure if that's what was supposed to happen, but I liked it). Thanks again for another wonderful recipe, maki! P.S. I have one of those crock pots where the crock sits inside the heating element, so it's heated on all sides but the top. Your mileage may vary if you have a bottom-only heat source. Can you suggest an acceptable substitute for the azuki beans? It is hard to find them where I live. Would any small bean do? Thanks! Things like split peas, small black beans, and even lentils should work, though depending on the bean it may need some pre-soaking and/or cooking. This looks sooo nice and comforting!! Just one question... It's nearly impossible for me to get a hold of brown rice here, so what do I need to change in the recipe (if anything) if I want to use just plain white japanese rice instead of brown rice? If you use azuki beans, you may need to pre-cook them before adding them to the white rice, so that they finish cooking at the same time. Interesting! This looks like a version of something my Chinese mother makes all the time, except that she adds sugar instead of salt and dried dates so it becomes more of a treat/dessert than a meal. Thanks for the recipe. I've been eating it for breakfast with a little maple syrup added. It's delicious, healthy, and starts my day off right.